At the end of last year we launched a Sage One app on the Google Apps Marketplace which enables you to login to Sage One Accounts or Sage One Payroll using your Google Apps for Business account. A number of you have recently called our Customer Support Team to ask how to link the two together. 6. And you’re done! It really is that simple. 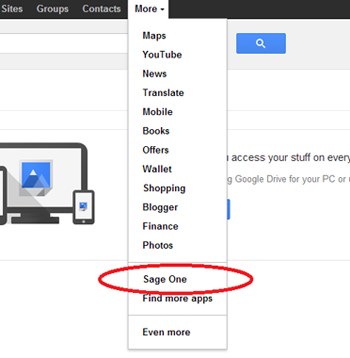 Now, whenever you’re in any of the Google Apps for Business services, simply click ‘More’ in the Navigation Bar to see Sage One. Our partnership with Google has also led to a number of other initiatives such as Google Drive integration which enables you to save automatic backups of your Sage One Accounts invoices and a great Google+ Hangout with them in February during which we discussed the benefits of cloud software for small businesses. Watch this space to see what else we come up with!